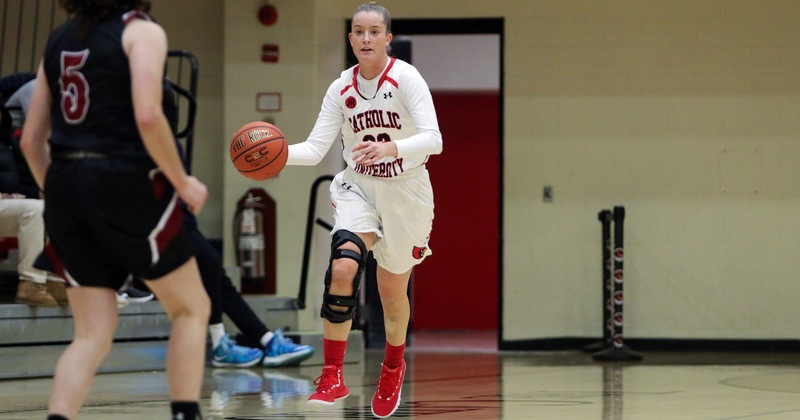 The Women’s Basketball team opened its season at home with a 57-52 loss to Stevens College this past Saturday. The Cardinals started out strong, ending the first quarter with a 14-7 lead over the Ducks, most of their points coming from Stevens turnovers. Catholic extended its lead in the second quarter, making the score 28-16. Guard Ashley Smith scored 13 points on 5-10 shooting from the field. The Cardinals lost some momentum in the second half of the game, but still held the lead in the third quarter. The Ducks had reduced the lead to 10 points to make the score 41-31 in the third quarter. The Ducks came into the fourth quarter with renewed vigor, and began to outshoot the Cardinals and managed to tie it up 44-44 with just under 4 minutes left in the game. The Cardinals managed to take the lead again, but ended up falling to the Ducks thanks to 4 free throws in the last few minutes of the game. The team learned a lot from this loss and believes there is much to be improved upon. “I think we played well as a team but have a lot to work on. We need to focus more on the little things such as boxing out, taking our time with the ball and making accurate passes. I want to come out every game and play my hardest in order to help the team win,”freshman Luca Mamula said. The team has big goals for the season and will not let this loss be a discouragement. “Our goals this season have been set high, especially after the heartbreak from last season and not reaching the postseason. We definitely want to compete this year, we want to make it to the Landmark Conference playoffs, play for the championship and ultimately win it so that we can get the opportunity to play in the NCAA tournament,”senior Emily O’Connor said. The Cardinals play again Friday November 16 at the Stockton Tip-Off Tournament against Penn State Abington at 8 p.m.